How Much Do Movies Make? Good or bad, the only performance metric we will consider is how much a movie makes in the box office relative to how much it costs. 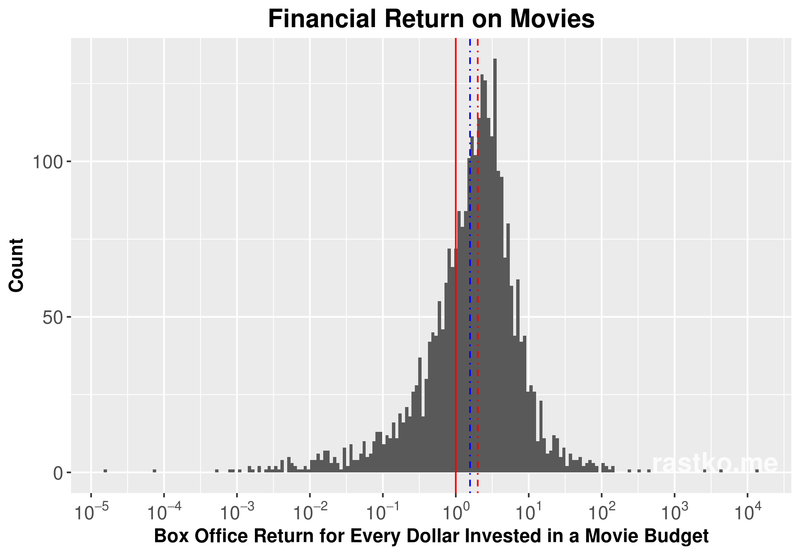 Intuitively, one would expect that there is a causal relation between the two, that is, on average, the more money is invested into a movie the more money it will make in the box office. Of course we can’t expect to have a simple and accurate formula that will determine the relation between the two as there are many factors that contribute to a movies success (advertising, release date, number of showings, etc…). However, with the data we have at our disposal from BoxOfficeMojo, we can use statistical methods to determine how causal the relationship is and just how profitable movies are. Let’s begin by plotting the budget of a movie against how much it makes globally in the box office. The data indicates that there exists, on average, a linear trend between budget and box office revenue. The variance of the box office revenue relative to its budget is large, which means that any linear fit will give us a large mean squared error (MSE). The variance is a lot larger for movies with lower budgets and it decreases for movies with higher budgets. Movie budget data tends to have low fidelity with many movie budgets rounded up or down to nearest order of magnitude. Major motion pictures with a wide release and big production companies are overly represented. Movies that have been released within the last two decades are also overly represented. Low budget films are under represented, but this may have more do with 1. as movie budget and the size of the release are correlated. Budget data it self isn’t that reliable and the website is fairly opaque as to its sources. Currently I don’t have the time or the data at my disposal to be able to get rid of all the biases and re-weight the data. As such the the biases will persist within the analysis. The most pernicious bias is the accuracy of the movie budget information as it is known to be unreliable. It is well known that production companies have a tendency to distort movie budgets through a practice known as Hollywood accounting, whereby they inflate or deflate the budget numbers as it suits them. The whole industry is rife with secrecy about their movie budgets that there is a special term for it 3. Unfortunately there is not much we can do about the accuracy of the budget data and, for what its worth, we will have to take it at face value. We define to be the global box office revenue of a movie and to be it’s budget, is the profitability ratio and is the power parameter 4. Conveniently, the above monomial model turns into a linear model in log-log space, which we have plotted above. This allows us to use linear regression to determine the parameters and . If there was a purely linear relation between and then we would expect to be (or statistically close to it) and the model would reduce to . Before I continue to the statistical analysis of our movie data I would like to digress a bit and discuss the role of theaters in the movie industry. It is often said that theaters are in the food business, not the movie business. This is primarily because the margins on the theaters concession stands are much higher than the ones on the movies. Most theaters in north America belong to one of the big movie theater chains. Cineplex almost has a monopoly in Canada with approximately 80% market share while in the USA the landscape is more competitive with Regal Entertainment, AMC Entertainment, Cinemark USA, Carmike Cinemas, and National Amusements controlling 45% of the market. Luckily all of these companies are publicly traded and anyone can view their financial statements. From there we can get an estimate of how much money they make on concession vs. how much money they make on movie tickets. Looking at their annual income statement one can see that 50% to 65% of the theaters revenues comes from admissions and around 30% of the revenue comes from food and beverage sales. The rest comes from advertising and other ventures which vary from company to company. However looking at the operational costs we can see that the margins on movie tickets are around 100% where as the margins on food and beverage sales are around 800%. This explains why your theater popcorn and drink are so expensive. More interesting are the contracts that theaters sign with movie distribution companies to show a movie. While on average 50% of what you pay at the box office goes to the theater and the other 50% goes to the distribution company, the actual contracts are negotiated on a movie by movie basis. The contracts themselves have an interesting payment structure. They heavily favour the distributor in the early weeks of the showing, and slowly shift to favouring the theater later on. A typical contract could be something like 90% of box office revenue goes to the distribution company for the first two weeks of a movies release, and after that 90% of the box office revenue goes to the theater. Having access to the terms of these contracts would give a much better picture of how Hollywood operates, as well as how industry executives perceive the success of their movies. For now, we will use aggregate theater financial data to determine if a movie is profitable. If we will say that the movie is profitable. Given that we don’t know the actual terms and conditions signed between the movie company and the theaters showing the movie, it is entirely possible for a movie to make money and as it is possible for a movie to lose money and . If then the movie is breaking even, and if then the movie is not profitable. We can use our data to determine the line of best fit and measure the correlation. 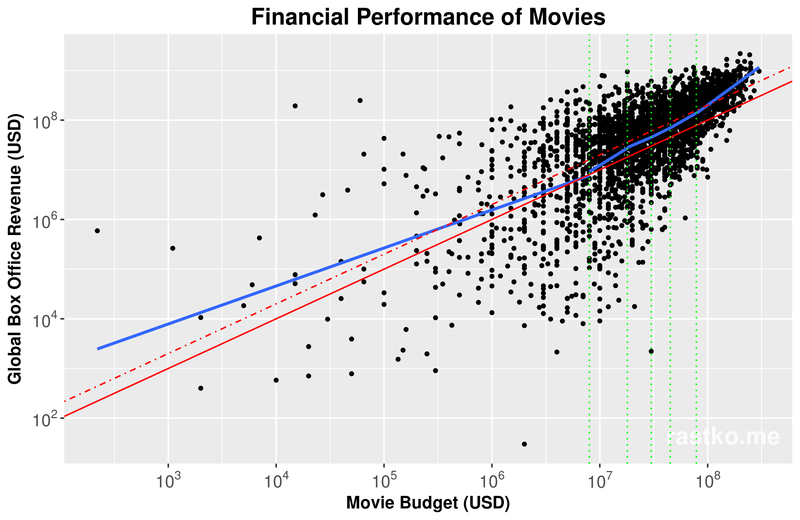 We can also segment our data based on the the movie budget to see how our model behaves over different budgets. Below I have ranked all the movies based on budget, and placed them in six different bins, resulting in around 500 data points per bin. Given the data at our disposal, we can also look at the distribution of the movies’ financial performance. This can give us a sense of how good of an investment a movie is. Its quite interesting to see what the shape of the distribution looks like. There are extremes on both ends of the distribution with some movies making more than $10k for every $1 of budget, and some movies making fractions of a penny for every $1 of budget. The breakeven line (solid red) and the profitability line (dotted red) give a sense of how well of an investment a movie is. I also calculated the mean (dotted blue line) and the median. Interestingly enough, the median of the distribution is exactly 2.001 which is pretty much the same as the profitability line (median line is omitted since the two lines would overlap) and the mean is 1.57. From this we can deduce that 50% of movies are profitable and that on average, investing in movies is likely to lose money after taking into account the 50% the box office fees taken by the theater. While, on the surface, this may make it seem like a movie is a poor investment, taking into account the budget of the movie paints a different story. A production company may gamble on some number of low to mid budget movies that have a potentially high payout (such as John Wick), however, it is the high budget movies that make or break the companies bank 5. 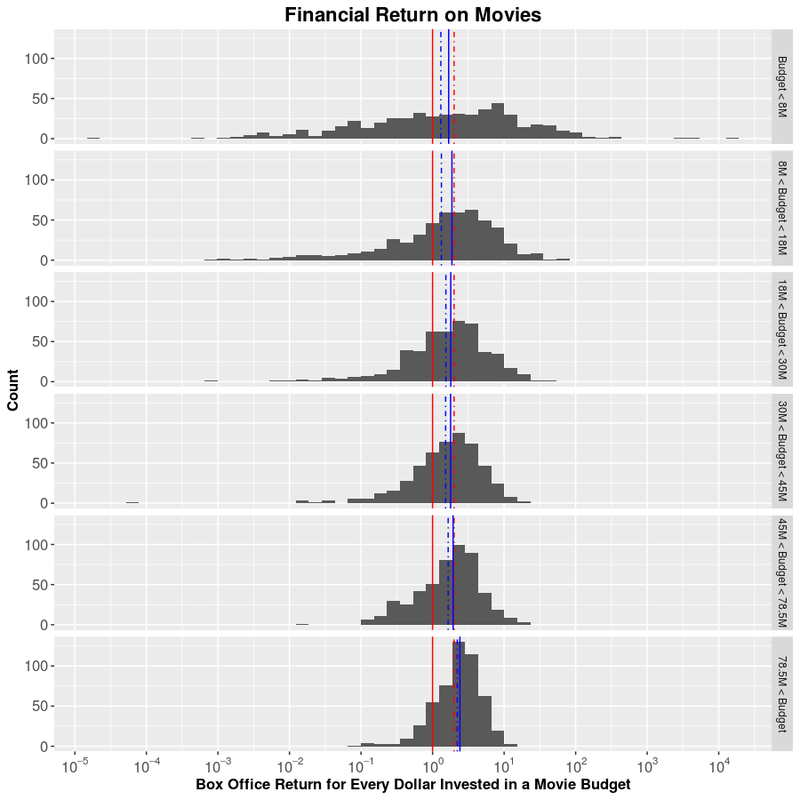 Segmenting the movie data by budget, as we have done in our linear regression model, allows us to see how the distribution of box office returns changes with budget. We can clearly see that the variance of the distribution decreases as the budget increases, a fact observed in our first linear regression graph. We also notice other interesting trends. Both the mean and the median increase as the movie budget increases and that the mean and the median seem to converge. This ties in with the idea that production companies are a lot more careful with bigger projects. The greater the budget, the more pressure there is to get a positive return on the investment and the less room for error. A loss on a $100M movie investment could be devastating for the production company, so the production company is willing to forgo a large potential return in exchange for a more certain smaller return. However, the company could absorb a couple of low budget flops which could potentially provide a large return on the investment. This is equivalent to the financial concept of risk-return tradeoff. Investment wise, The more expensive movies can be seen as blue chip companies and the less expensive movies are startups. It’s interesting to see all this movie financial data laid out. My main motivating factor behind this post was to present financial returns of movies in some nice plots as I haven’t been able to find this information elsewhere on the internet. While I looked at only one metric of movie performance, I haven’t really dug deeper into the qualitative aspect of the movies that succeed and those that fail in the box office. In my next post I hope to discuss how established franchises are Hollywoods safe investment and how successful single movies get turned into franchises.